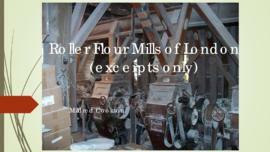 "Roller Flour Mills of London"
Presentation given at Greater London Industrial Archaeology Society. Slides with copyright images have been removed from the attached file. A Grade II* listed historic roller flour mill powered by water from the river Wye. The present mill was built in 1874 by John Caudwell and run as a family business for over a century.Ground floor north end, packing and weighing room. A Grade II* listed historic roller flour mill powered by water from the river Wye. The present mill was built in 1874 by John Caudwell and run as a family business for over a century.Ground floor workshop with Mr A Fox. A Grade II* listed historic roller flour mill powered by water from the river Wye. The present mill was built in 1874 by John Caudwell and run as a family business for over a century.Worker filling flour sack. A Grade II* listed historic roller flour mill powered by water from the river Wye. The present mill was built in 1874 by John Caudwell and run as a family business for over a century. A Grade II* listed historic roller flour mill powered by water from the river Wye. The present mill was built in 1874 by John Caudwell and run as a family business for over a century.Purifiers. First floor, near west wall, view from south west. A Grade II* listed historic roller flour mill powered by water from the river Wye. The present mill was built in 1874 by John Caudwell and run as a family business for over a century.Third floor (roof), view from north. 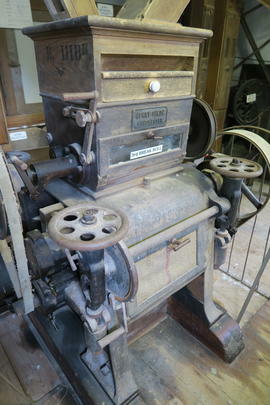 A Grade II* listed historic roller flour mill powered by water from the river Wye. The present mill was built in 1874 by John Caudwell and run as a family business for over a century.First floor near west end. View from the southwest. A Grade II* listed historic roller flour mill powered by water from the river Wye. The present mill was built in 1874 by John Caudwell and run as a family business for over a century.Second floor, south end. A Grade II* listed historic roller flour mill powered by water from the river Wye. The present mill was built in 1874 by John Caudwell and run as a family business for over a century.Third floor (roof). View from the north. A Grade II* listed historic roller flour mill powered by water from the river Wye. The present mill was built in 1874 by John Caudwell and run as a family business for over a century.Third floor (roof). Sack hoist.